Global markets are struggling. This also has repercussions for the Swiss economy. After last year's record-breaking year, export demand is rising only moderately. Only domestic consumer spending is generating growth stimuli. Credit Suisse is reducing its growth forecast. The Swiss economy expanded more strongly last year than at any point in the last eight years. 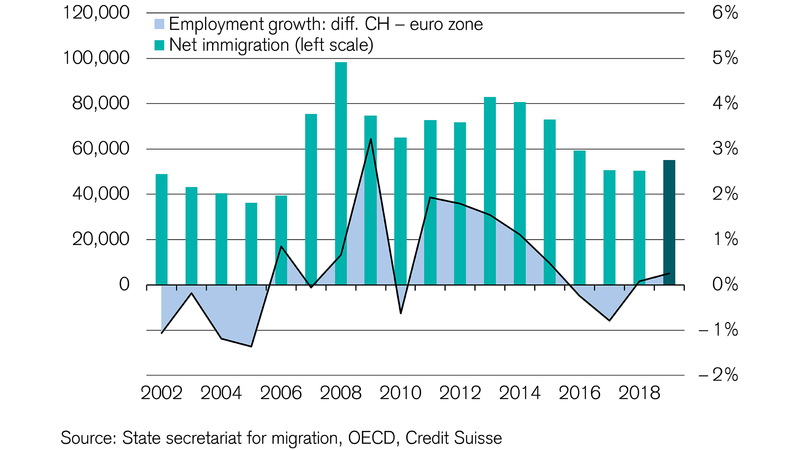 At 2.5 percent, GDP growth in 2018 even outstripped that of 2014, when economic output amounted to 2.4 percent just prior to the abandonment of the minimum EUR/CHF exchange rate. Whereas the first semester of 2018 was dominated by strong momentum, the second semester was then characterized by stagnation. Export growth receded against a backdrop of weak demand from abroad. 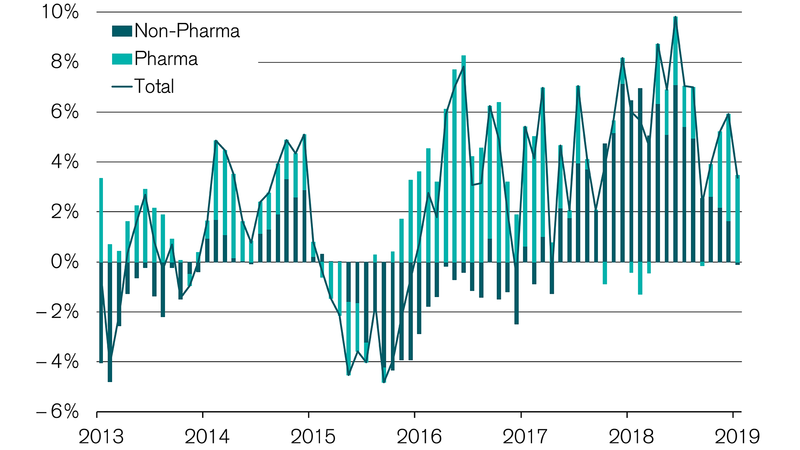 Only the exports of the pharma industry, which develops independently of the economic cycle, were able to stem the decline. The global economy is struggling. One reason for this is the slowdown in growth in China, one of the world's economic giants. You can find out just how much Swiss exports depend on the Chinese economy in Credit Suisse's Monitor Switzerland. The slowdown in global growth is also casting its shadow over the Swiss economy in 2019. The Credit Suisse Export Barometer, which measures the economic situation in export-receiving countries, has declined sharply. This decline is attributable to economic difficulties in both Europe and China. 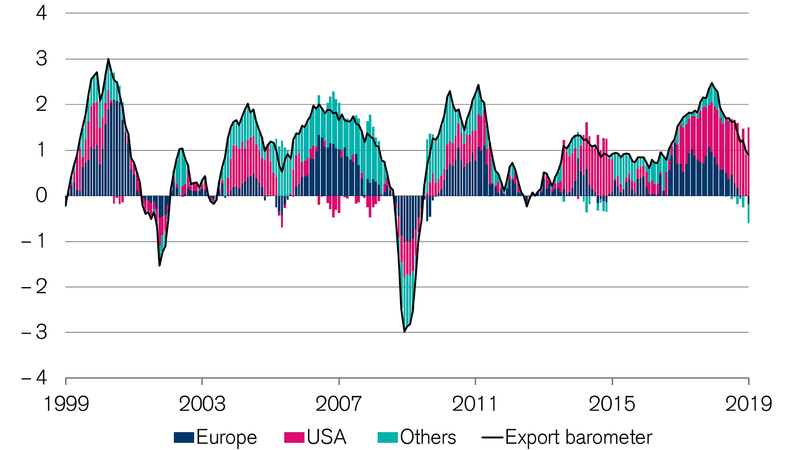 Only the US is currently supporting the Export Barometer. As a result, export growth can be expected to weaken further this year. The expert forecast is 2.5 percent, which would be the lowest figure since 2015. Despite lower export growth, Swiss SMEs remain confident. This is because figures are only reverting to their long-term average. Moderate demand for exports often goes hand-in-hand with a low willingness to invest. Accordingly, no additional growth stimuli are expected from investment in plant and machinery. Construction investment should also see only a marginal acceleration in growth. A clear obstacle here is oversupply in the rental apartment market. As demand is therefore largely covered, new orders are a rarity. Only consumer demand is increasing. This can be expected to be supported by the strong labor market situation and the resulting willingness of the Swiss consumer to spend. Slightly higher immigration could also boost demand. The experts are therefore anticipating consumer spending growth to accelerate from 1.0 percent last year to 1.4 percent in 2019. This rise in consumer spending will partly – but not fully – compensate for the weakness in the export economy. Accordingly, Swiss economic growth is likely to prove lower this year than in 2018. Credit Suisse is therefore reducing its growth forecast from 1.7 percent to 1.5 percent. The positive economic situation in 2018 had the effect of halting the trend of declining immigration that dated back to 2014. Immigration into Switzerland is now once again on the rise. This is likely to result in greater levels of employment, which should ultimately boost consumer demand. Experts are anticipating net immigration of around 55,000 Swiss and foreigners. Learn more about the Swiss economy.